On November 7, 2007, a cargo ship named Cosco Busan accidentally hit the San Francisco Bay Bridge and spilled 58,000 gallons of Bunker C fuel. 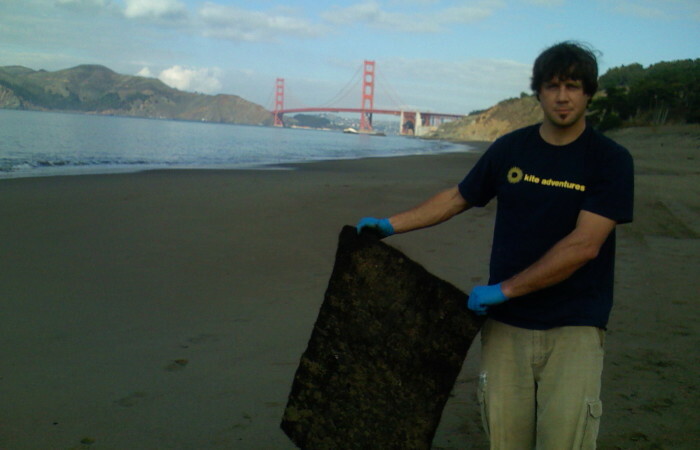 Within 48 hours hundreds of concerned citizens poured onto Bay Area beaches and helped soak up oil using mats made from human hair clippings that Matter of Trust had on hand. We told the surfers that we had hair mats and when the volunteers go to work, there were about 80 volunteers on the day of the spill, 250 volunteers the next day in the pouring rain and over 500 the next. Then the Red Cross came in to give a volunteer hazmat training session for 800 people; on the first night they had scheduled one class but there were so many volunteers they needed two sessions and announced two more for the following night.